The mechanism of thermal decomposition of rhombohedral iron(III) sulfate in air depends significantly on the conditions for diffusion of SO3 (temperature, thickness of the powdered layer, particle size). 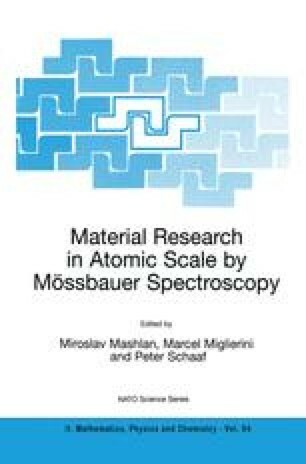 The influence of particle size on the reaction mechanism was studied at 600 °C using 57Fe Mössbauer spectroscopy and XRD. Corundum-type α-Fe2O3, bixbyite-type β-Fe2O3, and orthorhombic ε-Fe2O3 were identified as solid conversion products. Time dependence of the relative contents of individual polymorphs (x-Fe2O3/ΣFe2O3) is a suitable means for monitoring the mechanism of their formation and thermal transformation during the reaction process. The quantitative Mössbauer data obtained from the corresponding spectral areas demonstrate that different transformations occur in the surface layer and in the bulk of sulfate particles. Particles of β-Fe2O3 formed after loosening of SO3 from the surface layer of sulfate particles are relatively stable at 600 °C as documented by the very slow structural change to hematite. The formation of complicated ε-Fe2O3 structure is probably related with the slow diffusion of SO3 from the bulk of sulfate particles. The isochemical transformation of ε-Fe2O3 to hematite occurs more quickly due to its lower thermal stability in comparison with β-Fe2O3.